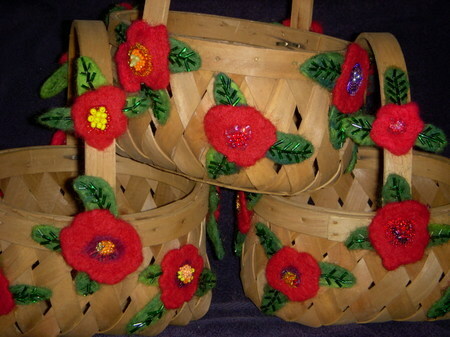 Well, the baskets aren't needle felted, but the posies on them are. My daughter is getting married on August 26th, this Sunday. She asked me to decorate the baskets the flower girls. My goal was to make baskets that would be fun and have a little zing, so I decided to needle felt some flowers, add beads and glue them to the baskets. I thought I would do roses at first, but the buds protruded from the basket too much. So, I came up with flatter flowers, the posie. What kind of flower is a posie anyway? I'm not quite sure, but my posies are just irregularly shaped red things. 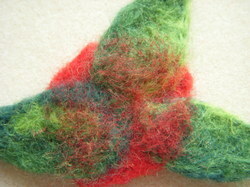 I started off by needle felting red disks that were about 1.5-2 inches in diameter. I'm not going to show them here in a photo because they were very straight forward to make. After I had a batch of the posies, I did the leaves. 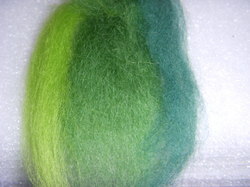 I pulled a bit of three different colors of green. 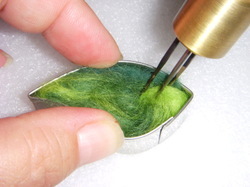 After felting a few leaves freehand, I decided to try needle felting them inside of a leave shaped cookie cutter. I stuffed the wool into the cutter and then needled it like crazy. I found that if you don't do this and really felt it down well before removing the cutter, you'll lose the good leave edge definition. I peeled it up off the foam where it was stuck really well. 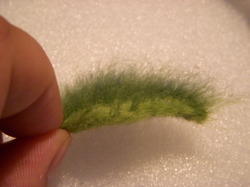 It was quite hairy on the side that had been inside the foam and I felted the fibers back into the leave with my needle almost flat against the leave so the fibers wouldn't just come out on the other side. This wored really well. I ended up with leaves that were pretty and uniform. 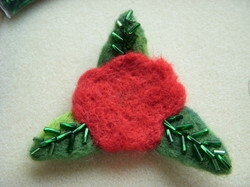 I laid three of them under the posie and poked 'em good with the needle until they were firmly adhered to the posie. I did a bunch of these so I could move onto the beading phase of the project. I beaded the leaves with bugle beads in a veined pattern. 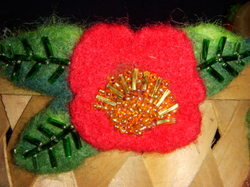 After the leaves were finished, I added centers to each of the posies. I thought at first I would do them all the same, but after I finished the first one, I went a little nuts and did each of the flower centers differently. It was fun to see what I was going to end up with each time. A few I really love, and a few are so-so, but once they made it to the baskets, they all looked good. I had three baskets to do so I ended up making thirty posies with ninety leaves, each leave and posie embellished with beads. I also made three posies into pins so the flower girls will match the baskets. I hope my daughter likes them.